Are you concerned about the bounce rates of your website analytics? Then you must aware of the email bounce rates too. Nowadays email marketing is having a vital role in digital marketing. In order to run email campaigns, the system should have very low bounce rate. High bounce rates can affect your sender reputation. There are two kinds of email bounces. Soft bounces are happening because of some temporary reasons such as the recipient’s mail box is full, the recipient’s mail server is down or the message content is too large. Hard bounces are produced when email is permanently bounced. It is happening because of various reasons such as invalid/non existing email address, invalid/non existing domain address or invalid mail servers. In simple words, junk email addresses creating hard bounces. Simply hard bounces are permanent and soft bounces are temporary. During subscriptions, the system should follow proper validations to not allow invalid email addresses. Keeping old email accounts without verifying the active email accounts. Not confirming the email address. Most of the modern websites and apps are not verifying the email addresses. This lead user to mistype their email addresses. Not handling the bounce messages and keeping the invalid email addresses in the list. Your system should monitor the bounced emails and should not send emails to the addresses which are already bounced. Keep only active email accounts in your email list. Clear your email list regularly of invalid emails and non-responders. Keeping the accounts which are inactive for more than 6 months or a year will make the system heavy and increase your costs in some cases. Use double opt-in by sending confirmation emails to subscribers to ensure the email address is valid. Monitor regularly to catch potential failures before they happen or before they do too much damage. What you can do if you already reached high bounce rate? If your website already reached high email bounce rate, you can follow below actions and bring back your website to low bounce rates. Validate your email list to remove all invalid email formats. Third party services like ZeroBounce and SendGrids are providing APIs to identify invalid emails. If you have large amount of email list, you can use this kind of service and get the list of invalid emails. Then remove the invalid emails from your email list. Be careful while removing invalid emails. The list from above services may also contain soft bounced email addresses. So, before removing the emails from list it is good to check the reason or status for the invalid email addresses. 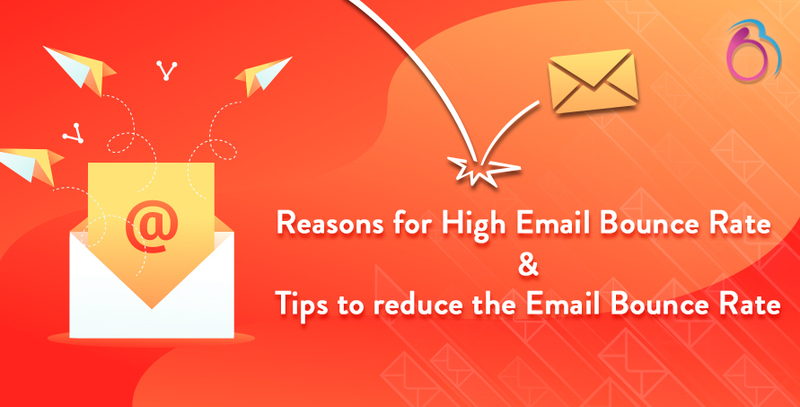 Once the email list is cleaned, follow above steps to avoid invalid emails and future email bounces. Email delivery is essential. Its table stakes for powerful email marketing, so if your email bounce rate is insane high, it’s the first thing you should fix. Concentrate to kick out hard bounces, screen soft bounces, and consider purging your email list of long term idle subscribers too.